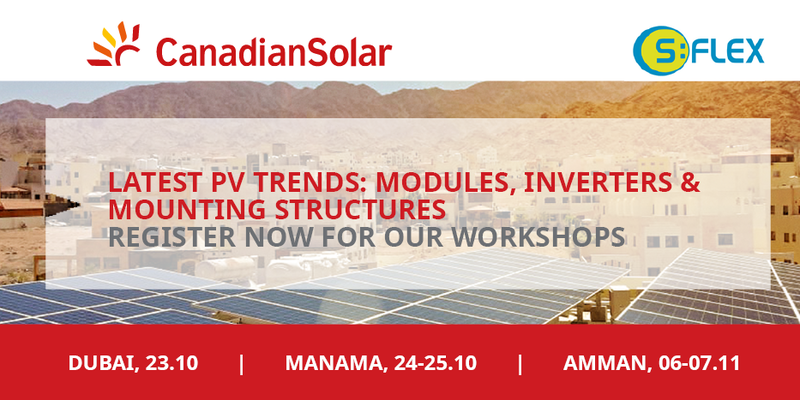 Canadian Solar Middle East and S:FLEX are inviting you to learn more about the latest module & inverter innovations and to get hands-on experience with various mounting solutions. Spaces are limited, therefore early registration is recommended. We will confirm your attendance via email, with a detailed location map in the following week. We are looking forward to your attendance in Dubai (23.10), Manama (24-25.10) or Amman (6-17.11), and wish you an informative event. Canadian Solar is an established global manufacturer of solar panels and has already made an impact in the Middle East region back in 2011. In 2012, we opened our first subsidiary in Abu Dhabi, followed by our second branch Canadian Solar Middle East DMCC in 2017. In addition, to better serve our customers, we have also established a logistic hub with professional warehouse facilities in Dubai, which will serve the entire region, timely and efficiently. With our recent project wins, including the DEWA III, the largest solar park to be built worldwide, we are a proven partner with a solid track record for your project requirement. Our MENA team is based in the UAE and has over 10 years PV experience. With additional support from the EMEA headquarter in Munich, Germany, over 90 highly skilled and motivated employees encompassing all business functions – sales key accounts, regional sales, business development, market intelligence, finance, technical, marketing, operations and legal affairs – are supporting the regional team in the Middle East.